Haunted castles dot the British landscape. Some are just ruins; some are now run as tourist attractions; and some are still lived in. Many are worth a visit. Read about Britain’s top ten spooky castles below. Muncaster Castle in Cumbria is haunted by the ghost of a mysterious White Lady as well as by Tom Fool a jester who worked in the castle 400 years ago and now likes to play tricks on visitors. Parties of 6-8 people can arrange for an all-night ghost sit in the Tapestry Room, said to be the castle’s most haunted spot. Scientists and paranormal researchers also conduct field experiments here and you can arrange to participate in one of these yourself with an all-night vigil. As well as being a delight to look at, the castle made famous by Shakespeare’s Macbeth has a panoply of ghosts to frighten visitors and fascinate students of the paranormal. Overnight stays are, alas, not an option here but the castle is open from 10am to 6pm each day. This appropriately named castle has a wealth of spooky stories to entertain visitors and its very own ghost-walker to tell them. Ghost tours cost £20 per person and run in the evenings all year round. The castle also occasionally has ghost-themed special events such as dinner evenings where a ghost hunter visits and relates some of his experiences in the field. 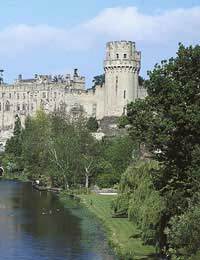 Now owned by the Tussauds group, Warwick castle plays host to many spectacular shows and events throughout the year. Waxwork figures and costumed actors help bring the past to life. The castle’s famous Ghost Tower is said to be haunted by the spirit of Fulke Greville, an Elizabethan poet and courtier who was murdered by an aggrieved servant. A monthly Ghost – Alive show recreates this gruesome event. Tutbury Castle in Staffordshire is more of a ruin than a functioning building, having been largely destroyed on the orders of Oliver Cromwell for harbouring the King, Charles I, during the English civil war. Despite this, the building has a rich haunted history which no doubt owes much to its tumultuous past. Mary Queen of Scots spent much of her imprisonment here and her ghost has been spotted on the grounds on several occasions. Tutbury is only open to the general public from Easter until September but special arrangements can be made for large parties at other times. The castle also runs ghost hunts which can involve overnight stays in the Great Hall or King’s bedroom. The official residence of Her Majesty the Queen plays host to a number of illustrious ghosts including Henry VIII, his sometime wife Anne Boleyn, Charles I, and George III. Only certain parts of the castle are open to visitors, and only during the day, so you may not get to see any of the famous ghosts even if they make an appearance, but you never know! Many mystery ghosts have been spotted at Bodelwyddan Castle in north Wales. The castle offers ghost walks; evening ghost vigils in which you use the latest equipment to try and detect ghosts; and, for the stout of heart, all-night vigils too. The castle is also an outstation for the National Portrait Gallery so, even if you don’t get to see a ghost; you should be able to absorb a little culture. Berre Pomeroy Castle in Devon is now no more than a picturesque ruin but it is said to be one of the most haunted spots in Britain. Both White and Blue Lady ghosts have been seen in the grounds. The first is believed to be the spirit of Margaret Pomeroy, imprisoned in the castle dungeon and left to starve to death by a jealous sister; the identity of the other is unknown. The castle is open to the public from March until October but only during the day. Tamworth Castle in Staffordshire is home to many ghosts, including that of one unfortunate woman who threw herself to her death over the battlements after learning that her lover had been slain. Another ghost, of the Black Lady, was famously photographed by a ghost-hunting team in the 1940s. Situated spectacularly on a hill overlooking the city, Edinburgh castle has its share of spectacular ghost stories, including that of the headless drummer boy who appears whenever danger threatens; and the Lost Piper who vanished one day while exploring the maze of tunnels beneath the castle. Britain abounds in haunted castles. Some are entertainment centres, where the past is brought to life by modern means; and some are just brooding ruins, where you’ll be left alone with the ghosts. Why not take a trip and have a pleasant hour-long excursion, or even a nerve-racking overnight stay? Hello I think it should be important to show more informations about the differents places. But this website is very interesting... Could yo give me informations about The vanishing hitchhik for my homework please !!! P.S : I'm sorry fot the mystake because I'm not Enlish, I'm from Mexico.... Thank you so much !!!!! There are probably ghosts associated with most castles and stately homes in Britain, at least the ones that aren’t in ruins. Mostly the stories will be apocryphal, but in some cases they’ll be well documented. There are plenty of books around to tell the tales of ghosts and local guides will be able to give you more background to particular stories. I love ghost stories, and have had several experiences myself. I would like to buy some of the books about England and the haunted castles.